During the "Landscapes of an Inner World" exhibition at the Haida Gwaii Museum in February and March of this year, I was asked to help create 6 large felted stories for the Loo Taas book by Amanda Reid, daughter of Bill Reid who designed and carved the Loo Taas. 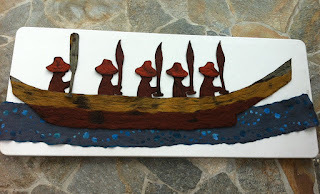 The felt canoes turned out to be 6 feet long and have felt water pieces to set the stage. 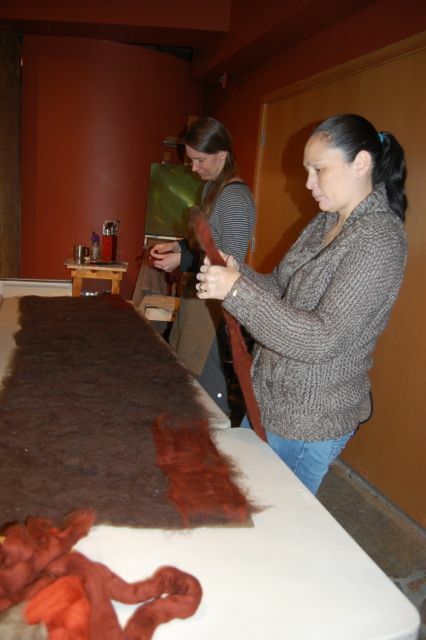 They will be used by 6 different children's organizations in our communities on Haida Gwaii. 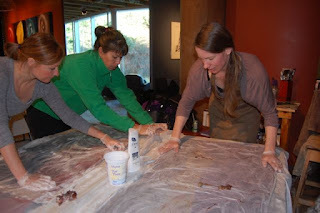 Dana Moraes, Angela Grosse and Tawni Davidson worked with me to create large sheets of felt, from which we cut the canoes, paddlers, paddles and cedar hats. As we used two different types of wool (Shetland and Merino), and each shrinks at a different pace, we created texture in the felt that turned out to look quite neat for the wood of the canoe. 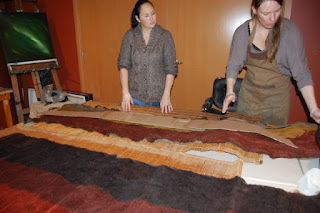 Once the felt had shrunk and was strong enough we let it dry and I sewed patterns into it to make it more durable, as it will be handled by small children. Several months later, all 6 canoes and water pieces have been completed. Coming September the pieces will be presented to the organizations involved. 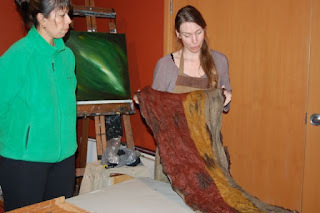 Thanks to Dana for asking me to be involved in this exciting project and thanks to all the helpers involved in the project, with special thanks to Angela who was always ready to provide space, support and strong arms and hands for felting!